DEV POST – THE EVE VEGAS 2017 MEGABLOG! Below is a repost of CCP Falcon’s latest update and information for EVE Vegas 2017! The time to kick off EVE Vegas 2017 is drawing closer and in just a few weeks, more than a thousand capsuleers will descend on Sin City for the largest ever gathering of pilots outside EVE Fanfest. With roundtables, presentations, charity raffles & movie screenings, the legendary EVE Vegas Party, plus a switch of pace from the traditional pub crawl to the Pub Night & Highroller Experience this year, there’s something for EVE Players from all walks of life at this year’s event. First, a word on tickets! On September 8th, we announced that EVE Vegas 2017 has sold out. If you’d still like to attend the event and are coming to Vegas anyways to hang out with your wingmen, be sure to add yourself to the waitlist via the EVE Vegas Eventbrite page and you’ll be notified if tickets become available. With the Pub Night & Highroller Experience also sold out, the same applies for tickets to this event. Similarly, the party only tickets have also sold out, however if more become available, we’ll be sure to inform those who’re waiting. We still have a few tickets left for the charity screening of Blade Runner 2049 on October 8th, however all the VIP tickets for this event have already sold out too. Be sure to join the wait lists and keep your eye on your email and the EVE Online News for more information. You’ll be able to check in and collect your EVE Vegas 2017 access pass, as well as tickets and wristbands for other events that you’re attending from 11:00 on October 6th, at The Linq’s convention center where EVE Vegas 2017 is hosted. Our amazing team of volunteers and developers will be on hand to make sure you have everything you need, and that you’re checked in as quickly and smoothly as possible! Pretty simple, you can find it in digital form here! EVE Vegas 2017 will kick off at 14:00 PDT (21:00 UTC), with Welcome to EVE Vegas. Days two and three of EVE Vegas begin at 10:00 PDT (17:00 UTC). Here’s a quick rundown of developer presentations during EVE Vegas 2017. In addition to this, these sessions will all be supplemented by roundtables and some amazing player presented content. Check the full digital schedule for all the details! Please be aware that the lineup is subject to change, so be sure to keep up to date by checking the digital schedule! Due to the huge size of EVE Vegas this year, we anticipate that the main presentation hall, Showroom, may fill to capacity for these two presentations, along with several of our larger and most attended developer presentations. With this in mind, we’ll be taking a leaf from the book of Fanfests past, and will be hosting a secondary live feed of the presentations in Social, where we’ll also have the EVE Store, as well as EVE Online, EVE Valkyrie and Sparc sessions ongoing. This room will also be equipped with a bar (of course! ), so if you’d prefer, you can chill out, grab a beer with some wingmen and watch the presentations from there. Please be aware that seating in Showroom will be on a first come first serve basis until the room is filled to capacity. All the major events, announcements and information from EVE Vegas 2017 will be streamed live on the CCP Twitch Channel for free, so if you can’t attend, you don’t miss out. Keep your eyes on the news for more information on the streaming schedule this week, and be sure to click the icons below and follow us on our various social media platforms for updates, contests and more! The legendary EVE Vegas pub crawl has continued to develop over the years, and for 2017 we’re kicking it up a notch while at the same time taking advantage of some of the facilities at The Linq – our new venue for this year. To shake things up a little this year, we’ll be kicking the evening off at 18:30 PDT with drinks at The Pool @ The Linq, before heading over for a 30-minute ride on the High Roller at 20:00 PDT. From there, at 21:00 PDT we’ll be headed over to an open bar with pub games at Virgil’s BBQ, where we’ll have the 2nd floor patio reserved for EVE Vegas attendees. Following three great years at the Chateau Nightclub and Rooftop we wanted to make some changes to the celebration this year. With it’s spacious dancefloor and outdoor area overlooking the stunning cityscape of the Las Vegas Strip, Drai’s, our new venue for the EVE Vegas 2017 party is conveniently located only 5 minute walk away from the LINQ – and as we’ve already announced, the one and only Permaband will be headlining the EVE Vegas Saturday night party. The party starts at 19:00 PDT and features 3-hours open bar service. All attendees meeting Drai’s dress code will be able to stay at the club once it opens doors to the public at 22:00, free of charge! 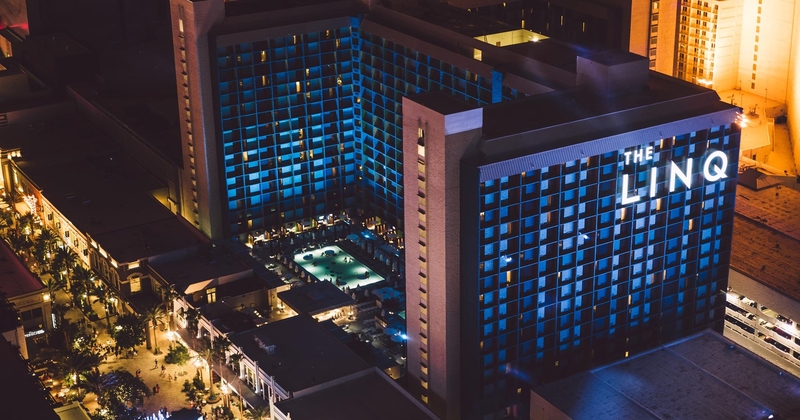 Given Drai’s ambitious line-up on weekends, and how hard it can be to get into the club, this can be an excellent opportunity for EVE Vegas guests to experience the very best of what Las Vegas nightlife has to offer. Blade Runner 2049 premiers during the weekend of EVE Vegas 2017 and to wrap-up North America’s biggest EVE gathering to date, we’ve organized a special fundraiser event that includes private screening of the film for EVE players & developers attending this years’ EVE Vegas to enjoy. All proceeds of the event, including donations made by EVE Online players around the world, will go towards the AbleGamers Charity. CCP Games covers the cost for the event, and our goal for this event is to raise $5,000 in support of The AbleGamers Charity. A few tickets for this event are still available, so be sure to pick them up before they sell out! The EVE Store is back at EVE Vegas in force this year, with new apparel, accessories, and maybe a community orientated piece of swag or two. In addition to this, we’ll also have the winning shirt from our EVE Vegas contest, “EVEolution”, on sale in the EVE Vegas Store this year. Be sure to check out “Welcome to EVE Vegas” for a little more information on what’ll be on offer in the store this year. As well as the charity screening of Blade Runner 2049 that will take place in support of The AbleGamers Charity this year, we’ll also be hosting a Silent Auction for several server blades from the Tranquility cluster at EVE Vegas 2017. In addition to this, as always, raffle tickets will be on sale during the course of the whole event, and we’ll be raffling a number of prizes during the closing ceremony. Check out “Welcome to EVE Vegas” on day one for more information on our sponsors, and their contributions to this year’s charity efforts! EVE Vegas 2017 is close, and is without a doubt going to be the biggest EVE Vegas yet. Over here at CCP, we’re incredibly excited to be shipping out to Nevada in just a few weeks to spend some quality time with the community. So much so, that we had to tie CCP Guard up and sedate him for a few hours while I wrote this blog because he got so excited. EVE Vegas 2017 kicks off in just three weeks. We’ll see you there, or we’ll see you in twitch chat! Such a relevant information are provided in your article.Thanks for sharing this post. I’ll immediately seize your rss feed as I can not to find your email subscription hyperlink or newsletter service. to now? I surprised with the analysis you made to make this particular put up extraordinary. WONDERFUL Post.thanks a lot for show..more wait .. I simply want to mention I am all new to weblog and absolutely enjoyed your blog site. More than likely I’m going to bookmark your website . You definitely have fabulous articles. Thanks for sharing your web site. What websites and blogs do the surfing area communicate most on? Leave a Reply to Health Benefits of Coconut Oil Click here to cancel reply.